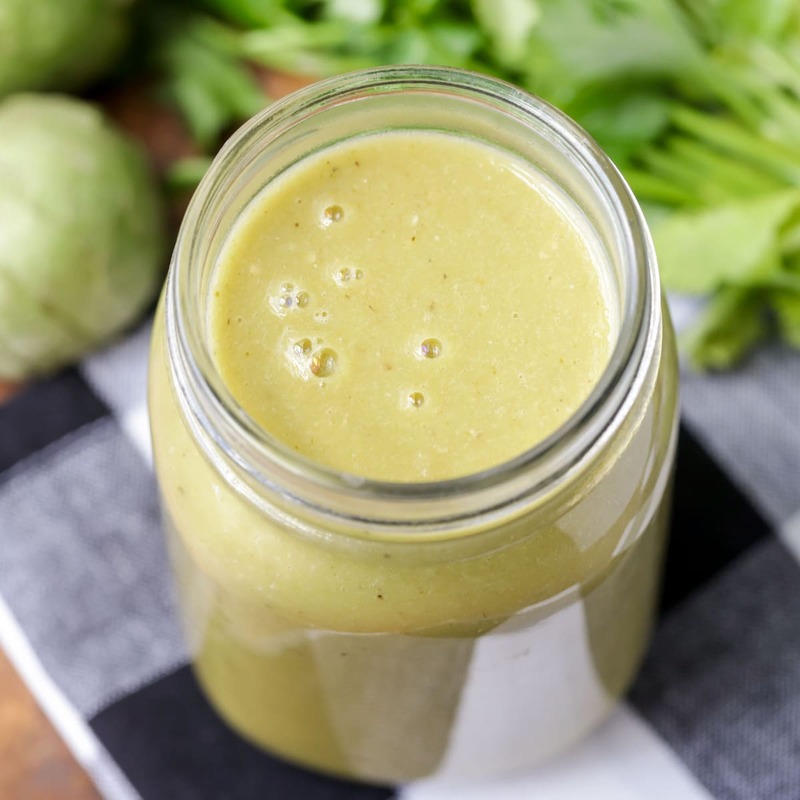 This homemade green enchilada sauce is your new best friend! 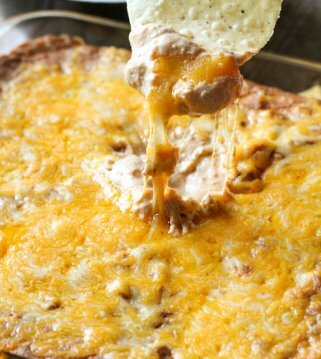 It’s perfect for pouring over cheesy enchiladas. It’s only a little spicy, and packed with flavors of cilantro, tomatillos, and cumin. 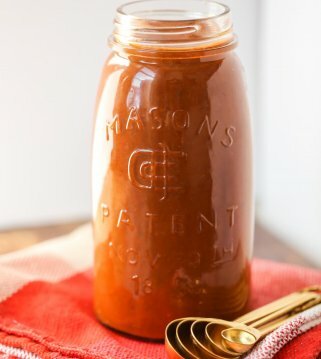 Homemade sauces are always better than store-bought. It’s just a fact. 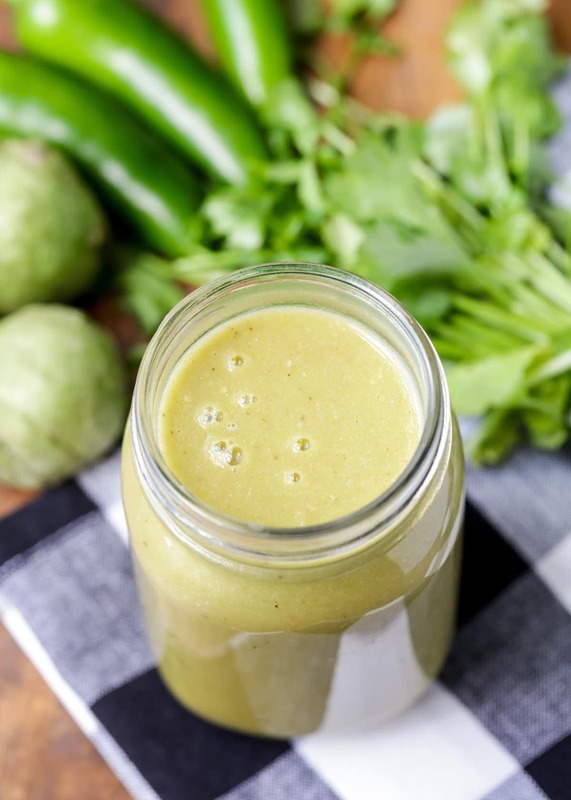 This homemade green enchilada sauce is so good it’s almost drinkable… almost . Enchiladas are one of my go to meals. They are great for family dinners or for bringing dinner to friends in need. And even though I love red enchiladas, my favorite kind of enchiladas are recipes that call for the green sauce. The flavor of green enchilada sauce is undeniably delicious. 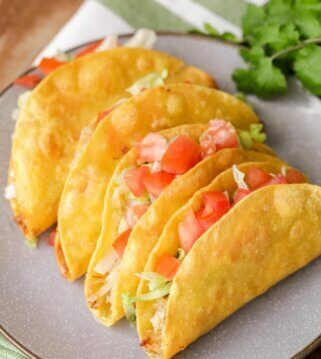 It melts perfectly into the cheese, chicken, and tortillas. I can almost taste it just by writing about it! 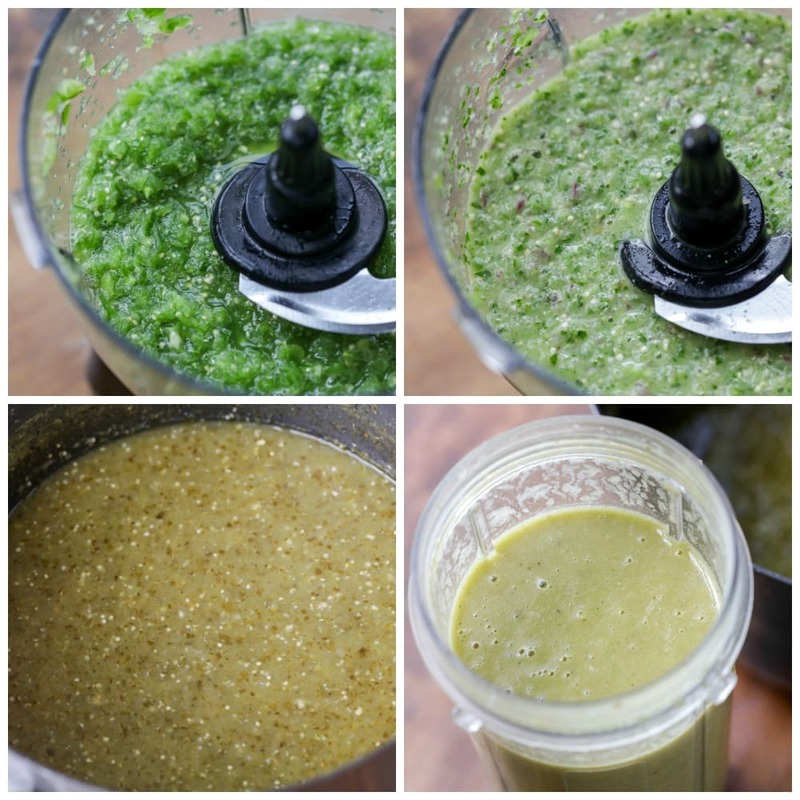 Have you ever made homemade green enchilada sauce? If you haven’t, I want you to try this recipe! 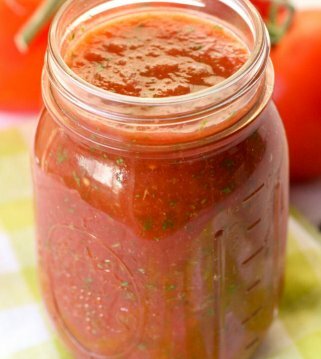 I promise that it is SO easy and you will never want to buy enchilada sauce in the store ever again. Your enchiladas will taste 100% better with a homemade sauce. How many tomatillos in 1 pound? This recipe calls for 1.5 lbs of tomatillos. That is about 14-15 tomatillos and they can be found in the produce section at the grocery store. If you’ve never cooked with a tomatillo, here are some tips! Make sure to peel the outer skin off of the tomatillos before you cut them in quarters. They can be a little sticky and sometimes dirty inside the outer skin. I always rinse them off after I have peeled them. 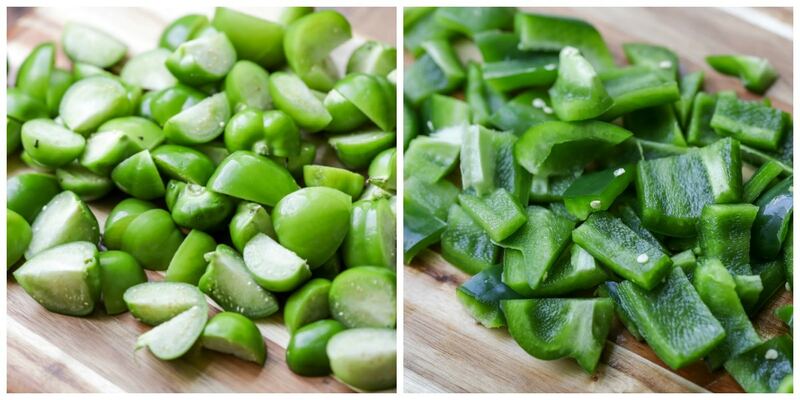 Then cut them into quarters before you throw them into the blender or food processor. After you’ve cut up the tomatillos, onion, bell pepper, and jalapeño, set them aside. Heat up the olive oil over the stove in a large pot or pan. Throw in the onions and garlic and sauté them until they are tender. Add the tomatillos to a blender or food processor and blend until smooth. Add the green peppers, jalapeños, and cilantro and blend until the clumps are smooth. Then add in the sautéed onions and garlic and blend everything together until smooth. After it’s all blended together, pour the tomatillo mixture into a big pot. Add in the chicken broth, salt, pepper, cumin, oregano and sugar. Simmer over medium high heat for 30 minutes. If there are still clumps you can add it back into your blender or food processor to make it smoother. How to make in slow cooker? The sauce can also be simmered in a slow cooker on LOW for 3-4 hours or on HIGH for 2 hours. This is a great option if you need to leave the house or need to do other things while the sauce cooks itself. What would we do without our slow cookers?? 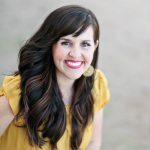 How to store green chile enchilada sauce? I like to store my green enchilada sauce in airtight containers and keep them in the fridge. Tupperware or mason jars with lids are both great options! Just make sure to use the sauce within one week. 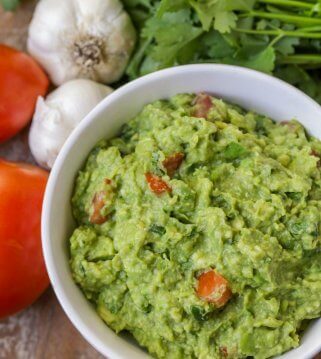 How to freeze green sauce? Freezing green enchilada sauce is a great idea. 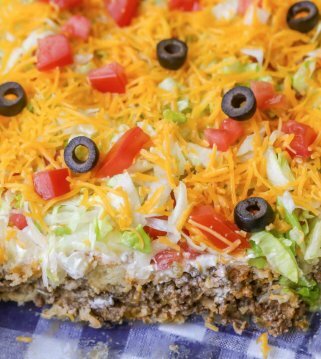 Sometimes I make a double batch of this recipe and freeze whatever I don’t use for enchiladas. Then whenever I need it, I just take it out of the freezer and let it thaw overnight in the fridge. Then, you just reheat it back in the pot for making enchiladas. We really are so glad we finally mastered our homemade green enchilada sauce. It’s taken us awhile, but this recipe is perfection. Be sure to also check out our red enchilada sauce which is amazing! 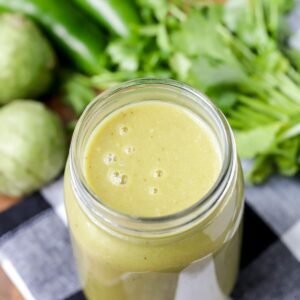 This homemade green enchilada sauce is only a little spicy, and packed with flavors of cilantro, tomatillos, and cumin. Heat olive oil in a large pot or pan and saute onions and garlic until tender. While onions are sauteeing, add tomatillos to the blender and blend. Add green peppers, jalapeno peppers and cilantro the blender and process until most clumps are out. Add the sauteed onions and garlic and process until mostly smooth. Pout the tomatillo mixture into a large pot. Add chicken broth, salt, pepper, cumin, oregano and sugar. Simmer for about 30 minutes. At this point, there will still be some clumps, so add this back to your food processor or blender and puree in batches until smooth. This sauce takes more effort but is defiNetly worth it. Ive always made red sauce but this is the first time ive tried green. Will do this again. Oh, wow! I was looking for a green sauce for enchiladas, as I like those more than the red ones & stumbled across this recipe. It was so delicious! I wouldn’t change anything! What a savory sauce! Way better than the store bought version! I love green enchiladas and I love homemade sauces! can’t wait to make these for dinner! Ooh this would be delicious on enchiladas or smothered on a burrito!! Can’t wait to cook some up! Yum! I love enchiladas! Thank you so much! This sauce is so good. It has the best taste! It takes a little time to make but it is so worth it! The homemade sauce really makes A difference in the dish. Yum! Im thinking ill have to make a large batCh to bottle for my pantry.